I looked a good, long time for Uncle Matt, as I’d heard him called. My Aunt Mary and I would have some enjoyable conversations about family history, and we did a lot of wondering about him. He was Aunt Mary’s maternal uncle, and a bit of a mystery. Matt Brevik. He left Norway at an early age and never looked back. 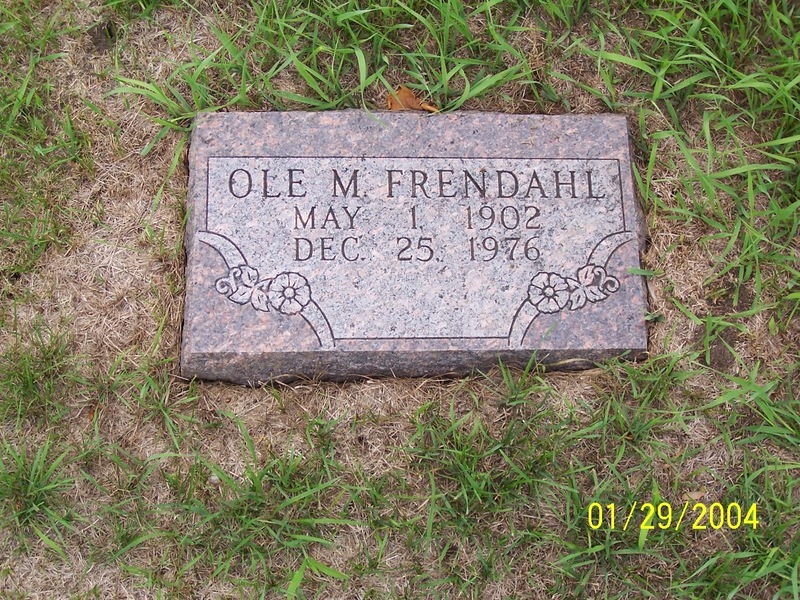 His sister, Agnes Brevik, had married my grandfather Adolph in 1921 and had come to the United States in 1923. Matt would disappear and resurface again periodically, Aunt Mary said. He had red hair, and was a lot of fun – the kids loved him. The last time she saw him she was seven years old. She speculated he was “in trouble with the law.” Mary said she thought that her father and my father had made contact with him, and visited with him sometimes in the 1960s. I was thrilled to have a clue! My father confirmed that he, my mother, and his dad went to Iowa, where Uncle Matt was working on a farm. Dad thought he was married to the woman who owned the farm, but he could not remember where in Iowa they lived. I searched every census I could find from 1920 onward for him. I searched Ancestry.com and every other database or forum I could find. I looked for any sign of Matt Brevik in Iowa, or anywhere else, but I found nothing. Meanwhile, across the ocean, a descendant of Matt and Agnes’ brother was trying to find out whatever had become of them. She found Agnes’ son’s obituary, and made contact with our family. What she told me about Matt was a game changer. She told me that he had left Norway and severed ties with his parents over some matter that was apparently very serious. They never heard from him again. 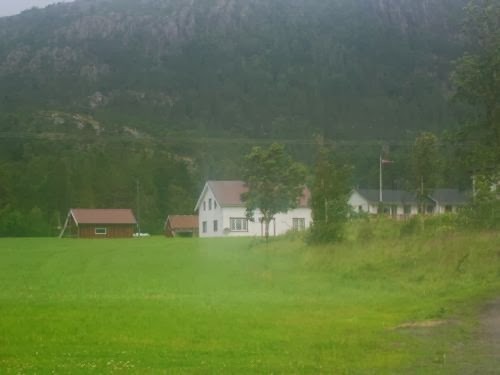 She was surprised that Agnes had used the name Brevik – Agnes’ father had used it at one time, when they lived on the Breivik farm, but after moving to Frendahl, they took that surname. She also said that Matt’s given name was actually Ole Mattis. Armed with a new name to search for, I started again, and this time successfully. The Social Security Death Index gave me a “last residence” for him, and the rest is history. Between Dec. 6, 1923 and Nov. 10, 1930, the name “Mathis” or “Mathias” Brevik appears on numerous “List or Manifest of Aliens Employed on the Vessel as Members of Crew.” The earliest manifest lists Mathis Brevik, 24 years old, 5’5” as a sailor. He is said to have 7 years’ service at sea. The final manifest I could find, Nov. 1930, lists Mattis Brevik’s age as 30. Our Ole Mattis would have been 28. There are enough similarities to our Ole Mattis to make me wonder if this is him, but a few discrepancies, particularly with age. However, Ole Mattis had a tendency toward inaccuracies in his documents, even when he gave the information himself. In some cases, he flat out lies. And our Uncle Matt seemed to have dropped off the earth between April of 1923 and 1932. 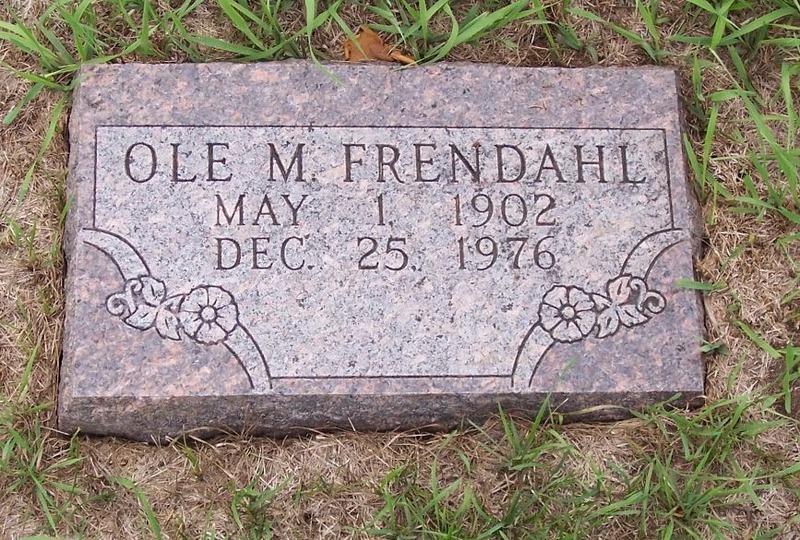 He appears next in Palo Alto County, Iowa in 1932, according to his obituary, where he would spend the remainder of his life. He was married for the first time in 1938, and would have four wives before his death from cancer on Christmas Day of 1976. He had no children. Various newspaper articles would indicate that Ole Mattis had his demons and difficulties. Despite them, he was said to have been a good carpenter, building homes and furniture. His obituary, as well as his death certificate, state he was born in New York. Perhaps “re-born” in New York would be more appropriate, considering his split with his parents and his past in Norway. I believe that in order to understand him and his life, it would be imperative to know what happened in Norway. Regardless, I hope he was able to make peace with it all. I had scanned hundreds of photos that evening, most of them with no identification, and most so small it was hard to see much without scanning. My eyes were tired. My back was aching. I had two piles for the completed photos - the Unknown pile and the Known pile, depending on what, if anything, was written on them. The Unknown pile was heaping, and I feared most of the little photos in the old trunk would end up there. My grandmother had moved to another town, and did not want these mystery photos, nor did she want to go through them. My father, knowing my affinity for family history, grabbed the beat up rusted old trunk from her pile of things to go to the trash. 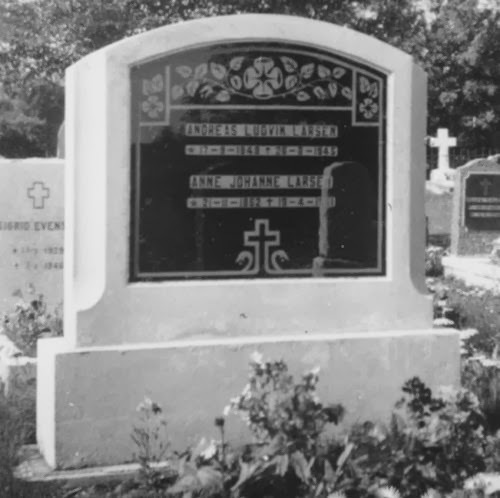 I scanned the little photo of a headstone, and as the scan came up on the screen, I had the photo halfway to the Unknown pile. I did a quick look at the name, and was ready to move on when something stopped me. I was pretty sure I would not know most of the people in those photos. My grandmother, Lisa, was technically my step-grandmother, and these photos were hers. She married my grandfather, a widower in the United States, when she was 50 years old and had come here from Norway at that time. Much of her life had been in Norway with her own friends and family, and I didn't know any of them. After hours of scanning, this little epiphany was enough to make me want to quit wasting my time and go to bed. And then I scanned the headstone photo. Lisa had grown up on the Klungseth farm next to my grandfather's family's farm at Hundhammer. As a child she played with my grandfather and his siblings. And she had known my great-grandparents. Their names, she had told me, were Andreas and Anne Larsen. 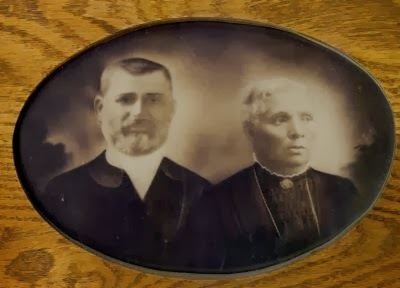 I nearly fell off my chair when I saw that the headstone photo was that of my great grandparents. I knew so little about them, and here they were, right in front of me. From that point on, I learned more about them rather quickly. Andreas was a farmer, and the area where they lived was exceptional for fishing, so he built a boarding house to rent beds to fishermen, and did a brisk business. Anne took care of the house and the animals. Lisa told me she was an incredible storyteller, and would entertain the children with her tales. Then, an uncle produced a photo of them, and cousins in Norway that I had met had photos to share as well. Andreas and Anne, with my grandfather Adolph, who was the baby of the family. Photo courtesy of Ivar Wiik. Their farm at Hundhammer. Photo courtesy of Tove Fagerhøi. 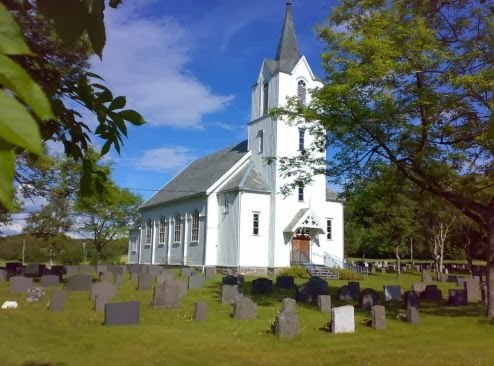 Steine Kirke, their church and cemetery, is just minutes from their farm. Photo courtesy of Iren S. Flasnes. I'm so glad I did not give up on all those tiny photos. There were a few other gems hidden amongst the unknown photos as well, but none like the headstone photo. After 16 days aboard the Amalfi, the Port of New York must have looked good to Nicolai Knutz. 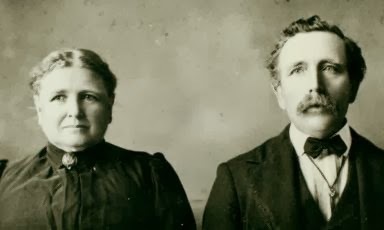 With his wife, Franken, and children Andreas, Georg, Hannchen, Boye Friedrich, Nicolai Jr., Wilhelm and Anna, they set out from their home in Tatting, Schleswig-Holstein, Germany, for Missouri. Life had been hard for them in Tatting, and Franken's brother Boie Nissen had come to America two years prior, and said the future held more promise than in Germany. So Nicolai sold the family's meager home to the city, getting enough money to pay for their passage on the ship and get them to St. Louis. 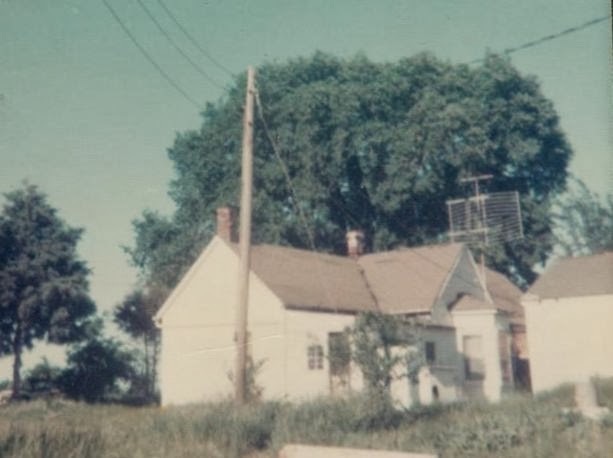 The small house south of Sedlia, Missouri, where the Knutzes raised their family. 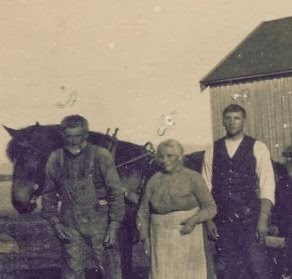 Once they made their way to Missouri, they settled on 40 acres of land in Pettis county, about 5 miles south of Sedalia, where they grew vegetables to sell. They lived in a small house with their seven children. 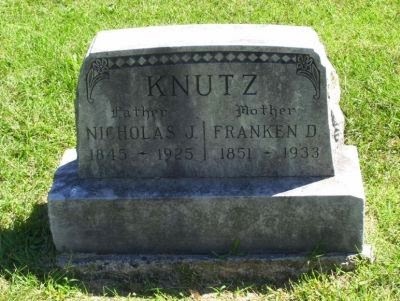 My grandfather, who was their grandson, met Nicholas and Franken once, as a small child when his family make the long journey from South Dakota to Missouri. He remembered Nicholas as "seeming like a giant" and having coal black hair and a red, brush-like mustache. While he did not remember his grandmother at all, his younger sister remembered that Franken would hand-piece quilts for them, which helped greatly during the harsh South Dakota winters. Nicholas died in January of 1925 at his home, a result of chronic kidney problems. Franken died in October of 1933, also at her home, from complications of cancer. They are both buried at Crown Hill Cemetery in Sedalia. In all the research I have done into the lives of my ancestors, never have I uncovered such a chronic set of poor circumstances than those of Susan Bliss. There is just something about her life story that is so sad, but brings up so many questions. She was born in 1838 in Pennsylvania, and married Jacob Givens there. Three children were born to them - Ella, Josephine, and a little boy, who lived such a short time that, except for Ella's obituary, there's no trace of him. And they would lose little Josephine within a few years. About 1865, Jacob, Susan, and Ella came to Princeville, Illinois, where Jacob was a wagon-maker for O'Brien Brothers. When the company expanded operations to Kewanee, Illinois, Jacob took his wife and daughter there, but he contracted typhoid fever and died. Susan moved back to Princeville, where several of her siblings had made their home. Two years later, Susan married William T. Lair, a young farmer and Civil War veteran. William had no children of his own, but apparently was close to Susan's daughter Ella, who named one of her sons after him, and William provided for Ella in his will. A young man by the name of Franklin Stallman also made his home with William and Susan, and shortly before his death, William added a codicil to his will stating that he considered Franklin "a member of my own family." Franklin was also an heir in the will, provided he stayed with Susan after William's death, and that he contributed to her support. During William's Civil War service, he contracted a "lung disease" from sleeping on damp ground and in swamps. The last two years of his life, he was unable to perform any manual labor. He did, however, own properties in Princeville. William died in 1877. By this time, Susan's daughter Ella had left home and married; Franklin Stallman, whom William considered one of his own family, was gone. Seven months later, Susan married prominent druggist and grocer Solomon Bliss. I found Franklin Stallman in the 1880 census, and he was in the home of Susan's sister Sarah, listed as her grandson. I was surprised to see that he was just 12 years old. 1896 would be a difficult year for Susan. Her third husband Solomon Bliss would die in September, but prior to that, it appears, trouble was brewing. The Bureau of Pensions received an anonymous letter from someone in Princeville accusing Susan of pension fraud. That anonymous person, who later was revealed to be a man named D. M. Potts, stated that Susan had been drawing a pension on the service of her husband William Lair, and had continued drawing it after her marriage to prominent businessman Solomon Bliss. The letter alleges that she was still using the name "Lair" and getting her mail in nearby Peoria. An agent was sent to Princeville to investigate. Three men seemed to be the most knowledgeable about the situation: D. M. Potts, Fred Gladfelter, and J. A. Pratt. All three were interviewed under oath. Potts said he had no firsthand knowledge, only that there was "considerable talk" among the people of their small town. Gladfelter did a fair amount of backpedaling in his testimony. His only firsthand knowledge, he said, was that he heard Susan's sister remark that it was odd that some soldiers' widows got $12 a month pension, and others (which he inferred to mean Susan) got only $8. Pratt said the bulk of his knowledge on the subject came from Gladfelter. Gladfelter told him that his sister, Susan Tarbox, who lived with Susan for a time, told him that Susan Bliss was drawing the pension and getting her mail in Peoria. While Potts and Gladfelter signed their testimonies, Pratt refused. However, Susan's headaches with the Bureau of Pensions was just beginning. Solomon Bliss died in 1896, and perhaps he didn't have as much money as generally thought, or perhaps Susan went through it quickly. But in 1901, she applied for a widow's pension from William Lair's Civil War service. Apparently bureaucratic red tape was alive and well in the early 1900s, as it took 2 years for her to receive an official rejection letter based on the fact that she was not William's wife during his military service. Appeals were filed. Reading over the correspondence between the Bureau and Susan was frustrating and heartbreaking. Numerous affidavits were given by men who served with William, testifying about his health both before and after his military service, and his lung problems in general. The government chastised Susan for not providing William's death certificate, though Illinois did not require them in 1877, and no such document existed. The same documents and affidavits were required of Susan over and over again. In a letter dated Jan. 2, 1906, Susan states, "while I would not wish to be troublesome to the Department, yet I am very anxious that some action be taken in my case. I am an aged woman and my health is very poor. Added to this, I am somewhat in want for the reasonable comforts of life. I feel if I were to receive anything under my application, I ought to have benefits soon." Her appeal was finally rejected, again, in January of 1907, this time because she could not prove that William's lung disease was a result of his time spent in the swamps and sleeping on damp ground. A local attorney came to her aid, and officially questioned the rejection in light of the evidence provided, and on July 23, 1908, received notice that the claim was rejected due to her remarriage. Unfortunately, it no longer mattered, as Susan had died two weeks earlier. How did Susan go through two estates so quickly? Were the estates of William Lair and Solomon Bliss not as large as it seemed? Regarding young Franklin Stallman - how did he come to be in William and Susan Lair's household, and being only nine years old when William added the codicil to his will, how did William expect that Franklin would be able to contribute to Susan's support? Was William presuming he had much longer to live than he did? He had been bedridden for the two months' prior to his death. Why were some people in Princeville so anxious to conclude Susan was involved in pension fraud? That the federal government was brought into it based only on conjecture, it would seem that Susan had made enemies. Regarding her desperate financial condition and poor health when Susan wrote to the Bureau of Pensions - she had written another letter a few months later asking for an update on her appeal, and said that friends and neighbors were concerned about her living alone, but that she had no money to pay anyone to stay with her. She did not mention that her family was concerned, just friends and neighbors. Considering that her daughter, and numerous siblings still lived in this small town, it seems that someone could have taken her in. Was her family not involved with her, and if so, why? Did she deliberately not mention her family in that letter, and if so, why? These are all questions that I have little hope of answering, but you never know! *The official investigation concluded that if Susan had received a widow's pension, $8 would have been the appropriate amount, but the investigator never cited any records of a pension, which I found odd. He also concluded that if Susan were receiving a pension after William's death, it would have gone up to $12. It seems like it would have been an easy matter to consult the Bureau's own records. In addition, in one of her appeals, Susan asked to collect a widow's pension for the time between William's death and her remarriage to Solomon Bliss, but was told that she did not meet the criteria, so it seems unlikely that she was ever able to receive any monies.